I am excited to be writing my first blog post about my recent experience in travel –a trip that took me to the Grand Canyon! Over the past year, I have been dreaming and scheming to explore this beautiful desert area by foot, and decided to challenge myself with the ultimate adventure - running and hiking from the South Rim to the North Rim and then back to the South Rim of the Grand Canyon in one trip. 40 whole miles, using just my own two feet. This is a trip that is not only frowned upon by park officials, it is considered to be highly dangerous, with varying weather and trail conditions at any point in the day and at any time on the trail. I left for Arizona excited, determined, and prepared. Experience in the backcountry had taught me how to survive physically down in the canyon. I camped at the trailhead on Sunday night, falling asleep after fixing the final preparations for my pack, nervously waiting for the morning when I would take off into this unknown territory. After my bag was packed, I noticed it was still light outside, even though it was about 8 o clock p.m. – the almost full moon filled the air with its beam, a star to the show being put on by outer space as distant planets and constellations lit up the sky. I looked towards the stars knowing that this trip was going to be the adventure of a lifetime. I set out at 4:30 in the morning on Monday, November 23rd. It was cold, crisp, and clear. I have never felt my heart beating so hard in my life – not out of physical exhaustion, but rather anxiousness of my ambitious trip. 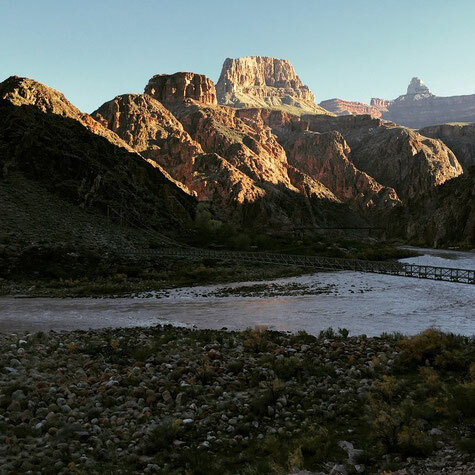 I carefully walked down the Bright Angel Trail, moving into the daylight step by step. I made it to my camp with my backpack full in about three hours, which left the rest of the day for me to move quickly towards the North Rim and back to my tent at the bottom of the canyon. As sunlight came into the canyon bottom, it became increasingly warm; still, I persevered through the hike, excited about each new twist, turn, and sight to be seen. Along the path, I encountered numerous amounts of people from all over the world, most hiking small sections of the trail with large backpacks in tow. One man was ambitiously running 46 miles of trail in one day, carrying a small backpack with water and snacks. I clipped along the trail with him for some portions, until my need to stop for water and breaks came too often and caused us to separate. 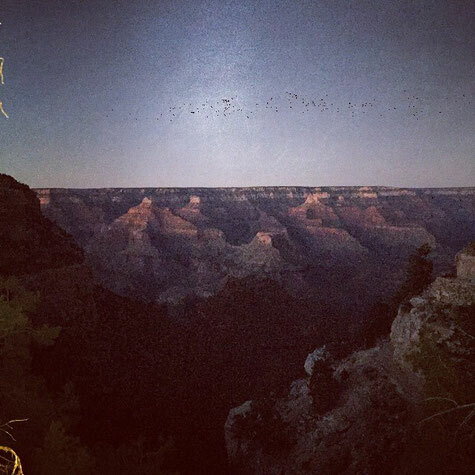 I found bits and pieces of company until I reached my camp again, about 10 hours later, exhausted but excited to have not only accomplished my goal, but to have seen the twists, turns, and views of the Grand Canyon that not many get to experience. Before falling asleep, I lay in my tent, stretching my legs in preparation for the soreness that I would feel in the morning. Let me tell you, NOTHING could have prevented the muscle fatigue that I felt upon waking up! It felt like torture to put on my backpack and hike the last 10 miles from the bottom to the top of the canyon. I moved slowly, step by step, moving up towards civilization again. When I reached the top, I was relieved and tired, but also missing my brief and beautiful home in the bottom of the canyon. I was proud as I looked across the giant hole in the ground, feeling accomplished. So what does this have to do with YOGA? Well, as a long distance runner, rock climber, and former dancer, yoga has provided me with a gift of understanding moving meditation. See, I believe that yoga comes in many forms – in asana, in stillness, and in movement with nature, for example. I believe that I do yoga everytime I lace up my shoes and go for a run just as much as when I enter a yoga studio. There were so many moments in the canyon where all I could do was focus on my breath, my next foot placement, then my breath again…where I had to enter a realm of steadiness, ease, and emptying my mind in order to make it just one step further. I had to do this to avoid panic, over analyzing my situation, anxiety, stress… the same things that we as human beings encounter regularly in life. And when I could truly grasp onto the moments when it was just me, moving through this huge desert, I felt so small, yet so infinite. I felt my pulse beat with the breeze as it shook the trees surrounding me, as water flowed across rocks in the stream, as lizards scurried across the canyon walls. I was a part of this place, connected, in a trance. I didn't have to question it, I was just there, living, breathing, moving. It was the practice of mindfulness that guided me through this grand adventure. Just for the moment, I was able to leave everything else behind and just BE right where I was. And if we, in our lives, can find more of these moments, living in the present, at any point, then we are engaged in our yoga practice. We are connecting our mind, body, and spirit. Whether it be outside on a trail, inside cooking a meal, at the neighborhood yoga studio, while playing a game or telling a story to a loved one – these moments in mindfulness, moving through this big space of life, recognizing our smallness, yet connectedness… that, to me, is yoga. I can’t wait to see you all in upcoming classes as we move together towards finding that same feeling! Howdy, I do believe your website might be having browser compatibility issues. When I look at your web site in Safari, it looks fine but when opening in IE, it has some overlapping issues. I just wanted to provide you with a quick heads up! Aside from that, wonderful website!